Stop the War protest representing Tony Blair, George W Bush and Gordon Brown with blood on their hands at the first public hearing of the Iraq Inquiry. 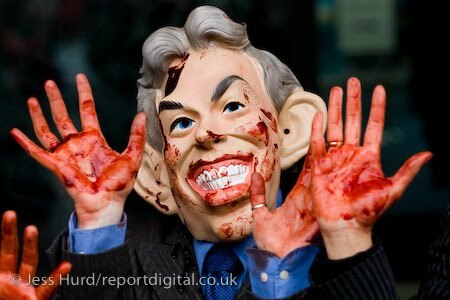 They demand that Tony Blair and Gordon Brown are held to account for war crimes which led to the deaths of hundreds of thousands of Iraqis and 179 British troops. Queen Elizabeth Conference Centre, London.